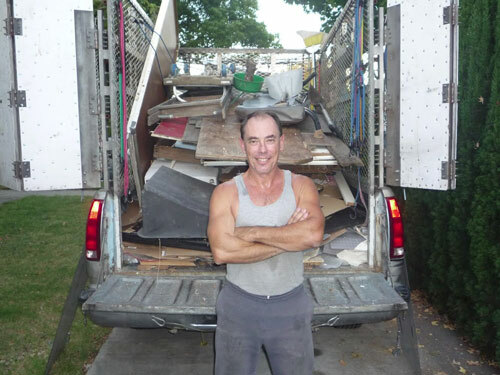 Probably more than any other type, I get calls to remove various kinds of junk from peoples garages, back yards, and the area surrounding the home. The second most common trash removal call is taking furniture, such as an old couch, chair or dresser from inside the house. Often the person or family will have just moved and need all the moving boxes and packing material removed. When they have unpacked the boxes the garage or driveway is full of boxes with the packing paper in them. I consolidate the paper and cut the boxes up so the cardboard is flat. When I’m done there are far fewer boxes which now are stuffed full with the packing paper and bubble wrap, and the rest of the cardboard is stacked carefully. The customers can’t believe the difference when I am done. The kinds of garbage I’ll be picking up from around the side of the house and back yard consists of tires, scrap metal such as old bumpers from a car, pieces of wooden fences, broken chunks of concrete, brick and cement blocks, children’s toys, potted plants, old refrigerators, washers, dryers and the contents of wood and metal in storage sheds. I also take away a lot of bicycles, broken wood and metal tables and torn mattresses. There was a property in Monrovia in which I cleaned out two houses, a garage, the surrounding grounds and demolished a camper. I cut the camper up with a sawzall in about three hours but the rest of the job took considerable longer. It was one of those places where no one had lived for many years and full of every kind of filthy trash you can imaging. The walls in the houses were black with dirt. The stoves, refrigerators and washer and dryer were just as black. As usual on these hoarding, trash removal jobs, clothes were all over the floors along with boxes of books, magazines, toys and a million other things. The mattresses were torn, the box springs were broken, book cases broken too. There was nothing I could take to the Goodwill, not a sofa, chair, coffee table, not a dining table, not even a night stand, nothing !!! The garage was just as bad with old broken tools, wood and metal cabinets and chests. Around the houses were tires, broken pieces of furniture, metal and wood. It was a mess and took two days to complete. When I get a call for a house or garage clean-out I never know what to expect. Sometime a relative has passed away and the children or other family members need to empty the property of whatever is there. It could be old tools and tires in a storage shed, and often demolishing the wood or metal shed as well, clearing out the back yard of old rusted car parts and broken wood fencing, and pulling out all kinds of junk from under the house. Inside the home there are often pieces of furniture and boxes of books and magazines and old wood doors. Down stairs the house is often full of furniture, with beds that must be removed, a refrigerator, sometimes stove, clothes and kitchen utensils. In the garage there may be a washer and dryer as well as a lawn mower, old metal bed frames, wooden slats and various tools and gardening equipment and rolled up carpet. 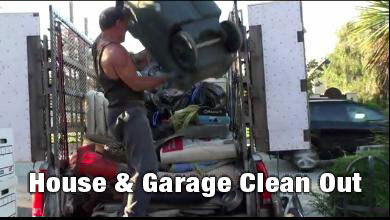 I get a lot of calls from realtors to remove various kinds of trash from garages. When their client is preparing to sell their home, there are often things such as ping pong tables, wooden chests, old pieces of wood, metal and things they just don’t use anymore, and get rid of for the house to be shown for sale. 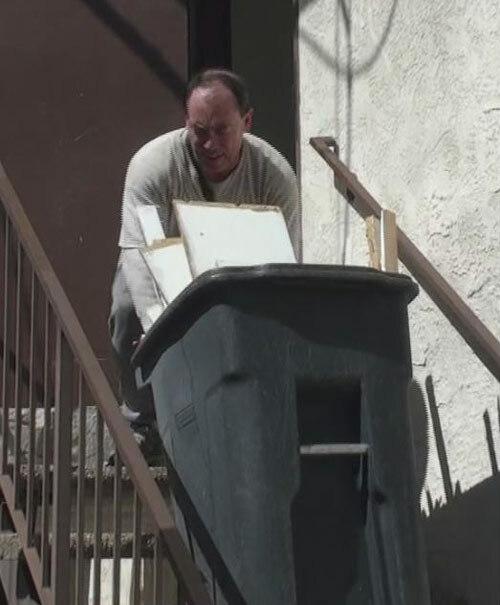 Other times the realtors will call me to take away trash from a house that was left by the previous tenant and it’s got to go in a hurry. This is what I am so well known for, getting to the job, the same day they call. and doing what it takes to remove whatever needs to go, from a wood hutch, dresser, couch or a metal storage shed full of garbage, they know they can count on me to get the job done.